Ideal for built-in storage space and wardrobes. Doors are allowed to bypass each other smoothly carried by nylon wheels on strong aluminium tracks. 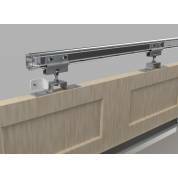 The system has two separate top tracks to allow fitment of thicker and heavier doors. The bottom channel fits to the door to leave the floor clear and provide easy access. For fitting two or more doors to bypass each other. 914mm (3’0? ), 1219mm (4’0? ), 1524mm (5’0?) & 1828mm (6’0?) kits supplied with fittings for 2 doors. 2438mm (8’0?) kit supplied with fittings for 3 doors. Adaptable to function with more doors per system using Fittings Kits SS2. Maximum weight for each door should not exceed 20kg (44lbs). Total weight of all doors should not exceed 40kg (88lbs). 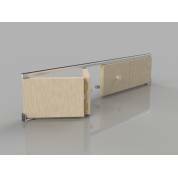 Minimum door thickness 16mm (5/8?). Maximum door width 1.22m (4’0?). Maximum door height 2.19m (7’6? ).